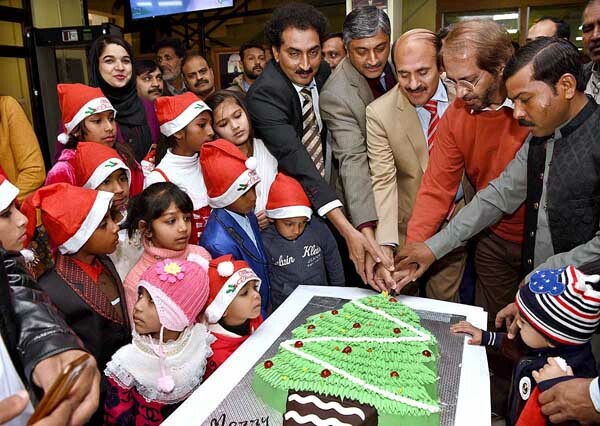 ISLAMABAD, Dec 19 (APP):The Christian employees arranged a colorful cake cutting ceremony to mark their forthcoming Christmas festival at Associated Press of Pakistan (APP) here Wednesday. Days before Christmas, besides cake cutting ceremony, the members of Christian community working at APP also decorated a Christmas tree on the entrance of APP building which is serving as major attraction with its beautiful look. They said, such events are only an opportunity to share joys of each other but also promote interfaith harmony at gross root level. Speaking on the occasion, Managing Director APP, Executive Director APP and other senior officials felicitated the Christian employees on their joyous occasion and pledged to resolve their issues besides creating such opportunities to promote interfaith harmony. Later, the employees prayed for peace, progress and prosperity in the country. With few days left in Christmas, the preparations of the forthcoming festival of Christmas are in full swing in twin cities of Rawalpindi and Islamabad as the Christian community living across the country is preparing to celebrate their festival with religious fervor. Stalls carrying Christmas props and Christmas trees have been setup at various markets in twin cities while the Christian community is also visiting markets for shopping on their major festival.